These are all of the spoils from some recent fat quarter swaps I participated in, including Darci's Wishing It Was Spring swap and the Sew Mama Sew swap. Also pictured here are three batik FQ's that I got from Rachel (of p.s. 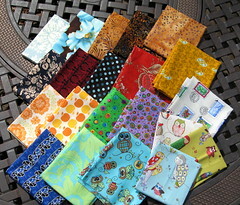 i quilt fame) in a private swap, and a few cuts of different owl fabrics that came with my mini swap quilt from Solidia. Thanks to all of my partners for helping to boost my stash!! I just found your blog thanks to a recommendation from google reader. I told my husband that he needed to get a new hobby--quilting. I just got started myself (I've only finished 1 and have 2 more on the way). hey hey hey...those are some nice fq's you got there. ok I know those 3 owls are from alexander henry's line but what is that other owl???? I want that one and have not seen it, it is gorgeous! Pleased the fat quarters finally arrived John. Enjoy! Wonderful fat quarters! A great variety. You now have to start cutting!